There is no mode of transportation more exhilarating than riding a motorcycle down an open highway. At the same time, bikers are at greater risk of injury than drivers. That’s why it is so important to wear the correct protective gear. 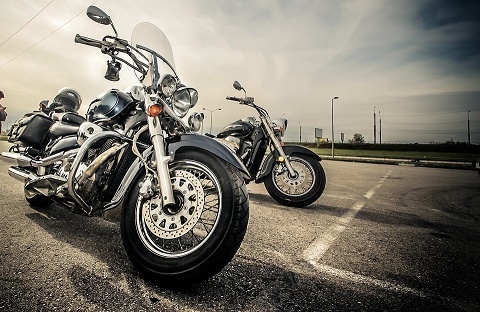 As fun as motorcycles are to ride, automobile drivers are notorious for not being aware of their presence, leading to thousands of accidents every year. With nothing between you and the road, having some form of protection can be the difference between life and death. The following items of protective gear are the most important pieces of equipment a motorcycle rider can wear. While they not always required by law, motorcycle helmets are the single most important piece of equipment bikers can wear. It is important the helmet fits snugly so it can protect your brain in the case of an accident. It should also have a visor to protect your face from damage if you slide along the road after an accident. A helmet with a visor will also protect you from being hit in the face by bugs, which is helpful since getting hit in the eye by a bug while riding along at 100 km/h can easily cause an accident. Some helmets may also allow you to wear a Bluetooth device so you can take calls while enjoying the freedom of the road. One of the most iconic images in film history is Marlon Brando in his classic leather jacket in the film The Wild One. As popular as this style is, there are other options that offer more protection. A good jacket not only will protect your skin in case of an accident but is a bit more stylish. It is great for staying warm when it is cool out and looks good even when you aren’t riding. Another style is an armoured jacket, which offers the most protection. These come in all manner of colours and styles and typically feature reinforced padding in the shoulders and along the back and sleeves. Some versions feature removable padding so that the jacket can be worn casually as well. There are even versions that are made with Kevlar which is exceptionally strong. A good jacket will not only keep you warm but will protect you from shredding your skin. Road rash is said to feel like you have a power sander rubbing away at your skin. It also leaves permanent scarring that is very noticeable and can only be fixed with expensive skin grafts. Gloves not only offer protection in case of a crash, but they will also help you keep a firm grip on the handlebars in case you get sweaty palms while riding or it rains. Motorcycle gloves come in a variety of styles that are designed for both off-road and street biking. Black leather is the classic style of glove and will match most leather jackets. Gloves for dirt bikes tend to be longer so that your arms are protected from rocks and other hard objects found off road. They even make gloves that are heated so people who enjoy riding their bike in the middle of winter can keep their hands warm. Riding a motorcycle is a fun way to get around and enjoy the road. Taking care to wear the proper equipment like helmets, jackets and gloves will ensure that you are better protected from the dangers of riding a motorcycle. By keeping yourself safe, you will be able to enjoy riding your bike for many more years to come.